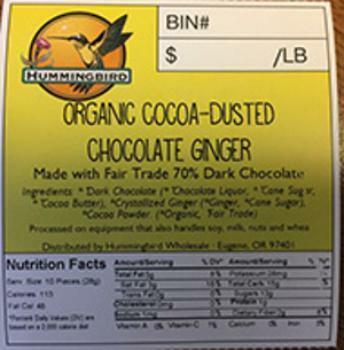 Hummingbird Wholesale of Eugene, Ore., is recalling 5lbs of Organic Cocoa-Dusted Chocolate Ginger. The product may contain hazelnut, an allergen not declared on the label. Customers who purchased the recalled product should return it to the place of purchase for a full refund. Consumers with questions may contact the company at 1-541-686-0921 ext. 105 from 8 am – 4 pm (PST), Monday through Friday.